Arianespace’s sixth Ariane 5 for launch in 2014 is now ready to receive its two satellite passengers after the vehicle was moved to the Spaceport’s Final Assembly Building in French Guiana. The Ariane 5 rolled out from the Launcher Integration Building – where its core cryogenic stage, two solid boosters and cryogenic upper stage were mated by industrial architect Airbus Defence and Space – to the Final Assembly Building for delivery to Arianespace. Now under Arianespace’s responsibility, the launcher is set for integration of its payloads – the Indian Space Research Organisation’s (ISRO) GSAT-16; and DirecTV-14, which was built by SSL (Space Systems/Loral) for operator DirecTV. This activity will be followed by the final verifications and subsequent transfer to the ELA-3 launch zone in advance of the scheduled December 4 liftoff. DirecTV 14 is a high-capacity spacecraft that will use Ka-band and the new “Reverse” DBS band to expand HD and other new consumer services. 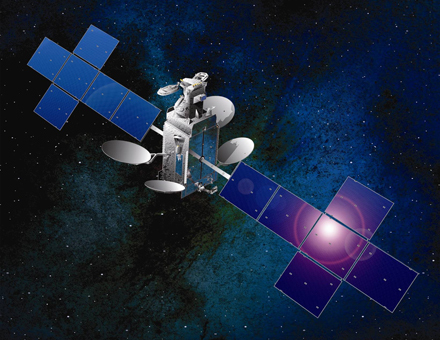 This satellite will be the sixth SSL-built satellite in DirecTV’s fleet based on the 1300 satellite platform. This satellite will provide service for users across the US (including Hawaii and Alaska) and Puerto Rico.